Yep - that process is known as pseudo-localization. What pseudo-localization does is create alternate versions of resource strings by using different characters that look similar enough to the original English characters that text is still readable - but obviously "localized". (This is one of those "a picture is worth a thousand words" moments, so please check out the Wikipedia article or bear with me for just a moment...) Additionally, because some languages tend to have longer phrases than English (German, I'm looking at you! ), there's often an additional aspect of string lengthening to simulate that and help detect wrapping, clipping, and the like. Aside: It's important to remember that the character "translations" are chosen exclusively on the basis of how similar they look to the original character and not on the basis of linguistic correctness, cultural influence, or anything like that! 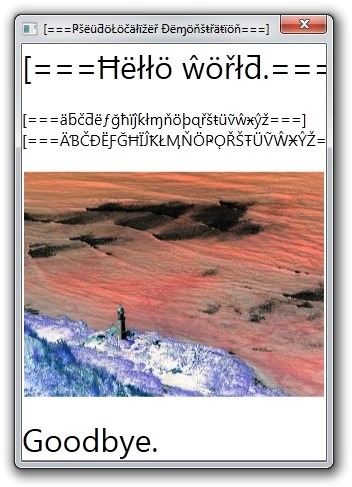 Here's the sample application I created for this post running in its normal English mode. (It's not very sophisticated, but it's good enough for our purposes.) Can you tell if all the strings are properly localizable? Are there any other localization concerns here? The class I've created is called PseudoLocalizer and it automatically pseudo-localizes standard .NET RESX-based resources. Using RESX-based resources is the recommend approach for building localizable Silverlight and Windows Phone 7 applications, the recommended approach for building localizable Windows Forms applications, and also a perfectly fine approach for building localizable WPF applications. Aside: The recommended technique for localizing WPF applications is actually something else, but I have some issues with that approach and won't be discussing it here. Add the (self-contained) PseudoLocalizer.cs file from the sample download to your project. Add PSEUDOLOCALIZER_ENABLED to the list of conditional compilation symbols for your project (via the Project menu, Properties item, Build tab in Visual Studio). Done! Not only will all localizable strings be automatically pseudo-localized, but images will, too! How does one pseudo-localize an image?? Well, I considered a variety of techniques, but settled on simply inverting the colors to create a negative image. This has the nice benefit of keeping the image dimensions the same (which is sometimes important) as well as preserving any directional aspects it might have (i.e., an image of an arrow pointing left has the same meaning after being "localized"). What I've described in this post works only on WPF; Silverlight has a couple of limitations that prevent what I've done from working exactly as-is. My next blog post will discuss how to overcome those limitations and use PseudoLocalizer on Silverlight, too! The way PseudoLocalizer works so seamlessly is by examining the type of the generated resource class and using (private) reflection to swap in a custom ResourceManager class for the default one. This PseudoLocalizerResourceManager works the same as the default one for loading resources - then it post-processes strings and bitmaps to provide its pseudo-localization effects. Private reflection (i.e., examining and/or modifying the internal data of an object) is generally a bad practice - but I tend to believe it's acceptable here because the target class is simple, its (generated) code is part of the project, and PseudoLocalizer is only ever going to be used as a development tool (i.e., never in a released application). Set the Access Modifier to "Public" in the RESX designer so the auto-generated resource property accessors will be accessible to the WPF data-binding system. Because the cost of fixing defects increases (dramatically) as a product gets closer to shipping, it's important to find and fix issues as early as possible. Localization can be a tricky thing to get all the kinks worked out of, so it's helpful to have good tools around to ensure a team is following good practices. With its low cost, simple implementation and friction-free usage model, I'm hopeful PseudoLocalizer will become another good tool to help people localize successfully! I definitely wanted to add BlobStoreApi support for fragmented Azure responses, but what about S3? Did my code have the same problem there? According to the documentation: yes! Although I don't see mention of the same "random" fragmentation behavior Azure has, S3 enumerations are limited to 1,000 blobs at a time, so that code needs the same update in order to support customer scenarios with lots of blobs. Fortunately, the mechanism both services use to implement fragmentation is quite similar and I was able to add most of the new code to the common RestBlobStoreClient base class and then refine it with service-specific tweaks in the sub-classes AzureBlobStoreClient and S3BlobStoreClient. Fortunately, the extra work to support fragmented responses is all handled internally and is therefore invisible to the developer. As such, it requires no changes to existing applications beyond updating to the new BlobStoreApi.cs file and recompiling! To be clear, each instance of AzureBlobStoreClient and S3BlobStoreClient is still associated with a specific container (the one that was passed to its constructor) and its blob manipulation methods act only on that container - but now it's able to manipulate other containers, too. Aside: In an alternate universe, I might have made the new container methods static because they don't have a notion of a "current" container the same way the blob methods do. However, what I want more than that is to be able to leverage the existing infrastructure I already have in place for creating requests, authorizing them, handling responses, etc. - all of which take advantage of instance methods on RestBlobStoreClient that AzureBlobStoreClient and S3BlobStoreClient override as necessary. In this world, it's not possible to have static methods that are also virtual, so I sacrificed the desire for the former in order to achieve the efficiencies of the latter. Maybe one day I'll refactor things so it's possible to have the best of both worlds - but for now I recommend specifying a null container name when creating instances of AzureBlobStoreClient and S3BlobStoreClient when you want to ensure they're used only for container-specific operations (and not for blobs, too). With containers getting a fair amount of love this release, it seemed appropriate to add a containerName parameter to the AzureBlobStoreClient constructor so it would look the same as S3BlobStoreClient's constructor. This minor breaking change means it's now necessary to specify a container name when creating instances of AzureBlobStoreClient. If you want to preserve the behavior of existing code (and don't want to have to remember that "$root" is the magic root container name for Azure (and previous default)), you can pass AzureBlobStoreClient.RootContainerName for the container name. I've also added a set of new #defines to allow BlobStoreApi users to easily remove unwanted functionality. Because they're either self-explanatory or simple, I'm not going to go into more detail here (please have a look at the code if you're interested): BLOBSTOREAPI_PUBLIC, BLOBSTOREAPI_NO_URIS, BLOBSTOREAPI_NO_AZUREBLOBSTORECLIENT, BLOBSTOREAPI_NO_S3BLOBSTORECLIENT, and BLOBSTOREAPI_NO_ISOLATEDSTORAGEBLOBSTORECLIENT. Aside: Actually, BLOBSTOREAPI_PUBLIC deserves a brief note: with this release of the BlobStoreApi, the classes it implements are no longer public by default (they're expected to be consumed, not exposed). This represents a minor breaking change, but the trivial fix is to #define BLOBSTOREAPI_PUBLIC which restores things to being public as they were before. That said, it might be worth taking this opportunity to make the corresponding changes (if any) to your application - but that's entirely up to you and your schedule. The last thing worth mentioning is that I've tweaked BlobStoreApi to handle mixed-case blob/container names properly. Formerly, passing in upper-case characters for a blob name could result in failures for both Azure and S3; with this change in place, that scenario should work correctly. 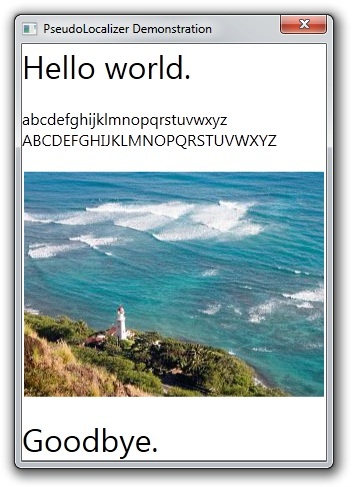 I've updated the combined BlobStore/BlobStoreOnWindowsPhone download to include the latest version of BlobStoreApi with all the changes outlined above. Although there are no new features in either sample, they both benefit from fragmented container support and demonstrate how to use the updated API methods properly. /// Lists the blob containers for an account. /// Creates a blob container. /// Deletes an empty blob container. As I discuss in the introductory post for Delay.Web.Helpers, I'm deliberately matching the existing WindowsAzureStorage API with my implementation of AmazonS3Storage, so these new methods look and function exactly the same for both web services. As part of this release, I've also updated the Delay.Web.Helpers sample page to show off the new container support as well as added some more automated tests to verify it. Whether you're using Silverlight on the desktop, writing a Windows Phone 7 application, or developing a web site with ASP.NET using MVC, Razor, or WebMatrix, I hope today's update helps your application offer just a little more goodness to your users! Microsoft released a bunch of new functionality for its web platform earlier today - and all of them are free! The goodies include new tools like WebMatrix, ASP.NET MVC3 and the Razor syntax, and IIS Express - as well updates to existing tools like the Web Platform Installer and Web Deploy. These updates work together to enable a variety of new scenarios for the web development community while simultaneously making development simpler and more powerful. I encourage everyone to check it out! You can see other examples of useful web helpers (including charting, cryptography, Xbox gamer cards, ReCaptcha, and more) in the ASP.NET social networking tutorial. Aside: While web helper assemblies like System.Web.Helpers and Microsoft.Web.Helpers are obviously easy to use from ASP.NET Razor and ASP.NET MVC, what's neat (and not immediately obvious) is that they don't need to be tied to those technologies. At the end of the day, helper assemblies are normal .NET assemblies and some of their functionality can be used equally well in non-web scenarios! One of the web helpers that caught my eye when I was looking around is the Windows Azure Storage Helper which makes it easy to incorporate Windows Azure blob and table access into ASP.NET applications. If you happened to be reading this blog a few months ago, you might remember that I already have some experience working with Windows Azure and Amazon S3 blobs in the form of my BlobStore Silverlight application and BlobStoreOnWindowsPhone Windows Phone 7 sample. When I wrote BlobStore for Silverlight, I didn't see any pre-existing libraries I could make use of (the Windows Azure Managed Library didn't (and maybe still doesn't?) work on Silverlight and there were some licensing concerns with the S3 libraries I came across), so I implemented my own support for what I needed: list/get/set/delete support for blobs on Windows Azure and Amazon Simple Storage Service (S3). But now that we're talking about ASP.NET, web helpers run on the server and the Windows Azure Storage Helper is able to leverage the Windows Azure Managed Library for all the heavy lifting so it can expose things in a clean, web helper-suitable way (via the WindowsAzureStorage static class and its associated methods). That's good stuff and the WindowsAzureStorage helper seems quite comprehensive - but what about customers who are already using Amazon S3 and can't (or won't) switch to Windows Azure? Well, that's where I come in. :) I'd thought it would be neat to create my own web helper assembly, and this seemed like the perfect opportunity - so I've created the Delay.Web.Helpers web helper assembly by leveraging the work I'd already done for BlobStore. This enables basic list/get/set/delete functionality for S3 blobs without a much additional effort and seems like a great way to help out more customers! Aside: I hadn't previously needed create/list/delete functionality for buckets, so the corresponding methods are not part of today's release. However, I expect them to be rather easy to add and will likely do so at a future date. To try to ensure I hadn't made any really dumb mistakes, I wrote a complete automated test suite for the new AmazonS3Storage class. With the exception of verifying each ArgumentNullException for null parameters, the test suite achieves complete coverage of the new code and runs as a standard Visual Studio test project (i.e., here's an example of using web helpers "off the web"). 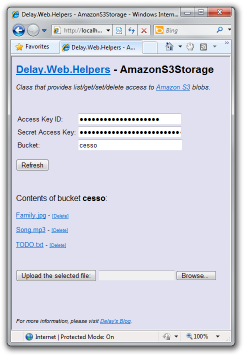 To use the Delay.Web.Helpers assembly in your own projects, simply download the ZIP file above, unblock it (click here for directions on "unblocking" a file), extract its contents to disk, and reference Delay.Web.Helpers.dll - or copy the Delay.Web.Helpers.dll and Delay.Web.Helpers.xml files to wherever they're needed (typically the Bin directory of a web site). Aside: Technically, the Delay.Web.Helpers.xml file is optional - its sole purpose is to provide enhanced IntelliSense (specifically: method and parameter descriptions) in tools like Visual Studio. If you don't care about that, feel free to omit this file! To play around with the included sample web site, just open the folder Delay.Web.Helpers\SourceCode\SampleWebSite in WebMatrix or Visual Studio (as a web site) and run it. To have a look at the source code for the Delay.Web.Helpers assembly, tweak it, run the automated tests, or open the sample web site (a slightly different way), just open Delay.Web.Helpers\SourceCode\Delay.Web.Helpers.sln in Visual Studio. Over the holiday break, I was asked to create a program to "speak" (via text-to-speech) simple sentences that were provided on the command-line. None of the available offerings were "just right" for the customer's scenario, so I was asked if I knew of any other options... Although I hadn't used it before, I figured the .NET System.Speech assembly/classes would make solving this task pretty easy, so I decided to give it a quick try. Because that was so easy, it felt like cheating; I decided to add support for a few more features to round out the offering and turn the whole thing into a free tool and blog post. The program I've written is called SayIt and is a window-less .NET 4 application to speak arbitrary text from the command line (or from a file) while allowing the user to make simple customizations (such as gender and volume). Use the command line to tell SayIt what to say and how to say it. When you run SayIt with the proper parameters (combine them in any order! ), SayIt uses the Windows text-to-speech engine to speak the text using the default output device. 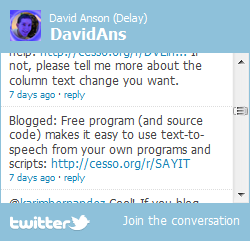 It does this without creating or showing a window, so other programs can make use of SayIt without distracting the user. Alternatively, SayIt can be called from batch files to provide status updates for custom scripts and the like. Simple text can be passed directly on the command line, while more complicated (or lengthy) text can be passed in a file (via the --Text option). SayIt I'm sorry, Dave. I'm afraid I can't do that. Aside from the simple gender, volume, and rate customizations that can be done on the command-line, the most likely tweak is fine-tuning the pronunciation of a particular word or words. (Though most sentences are quite understandable by default, some words come out a little garbled!) Fortunately, there's a W3C standard for customizing pronunciation and SayIt supports that standard (via the --SSML parameter): Speech Synthesis Markup Language. You say <phoneme alphabet="ipa" ph="təˈmaɪto">tomato</phoneme>. I say <phoneme alphabet="ipa" ph="təˈmeɪto">tomato</phoneme>. SayIt exposes the same volume settings that the System.Speech assembly does (via the PromptVolume enumeration), but you probably won't be able to increase the speech volume because the default setting is "ExtraLoud". This is not a bug in SayIt, either. SayIt Register your car at the -DOT.